It's time to make your plans to attend the 2015 Norwalk Boat Show – September 24 – 27, 2015 in Norwalk, Connecticut. We love this first fall show of the year for a lot of reasons, and you will too. It is one of the Northeast’s most popular in-water boat shows and the last in-water boat show in New England of the year! The Norwalk Boat Show is produced by the National Marine Manufacturers Association (NMMA), the world’s largest producer of boat shows and the leading association representing the recreational boating industry. In fact, the Norwalk Boat Show is the only in-water boat show that the NMMA runs in New England all year long, and one that you will not want to miss. In addition to the NMMA connection, there are several other reasons that Norwalk is one of our favorite boat shows. The Norwalk Boat Show is big enough to easily spend a half day walking around the boats in the water and on land, as well as all the boat accessory tents. In fact, it looks like they added another vendor tent this year. If you go to some of the seminars or test drive a boat, you can stretch the show out all day, yet it is also manageable enough to do the whole show in just a few hours. Admission is $15 at the gate, or $13 if you buy tickets by 9/23 at the show website. Parking is only $10 at Calf Pasture Beach (Drive PAST the boat show entrance to get to the best parking lot). And get this: the boat show has partnered with the Port Jeff Water Taxi, and with Uber, to make getting to the Norwalk Boat Show as easy as possible without driving over expensive toll bridges and paying an arm and a leg for parking. 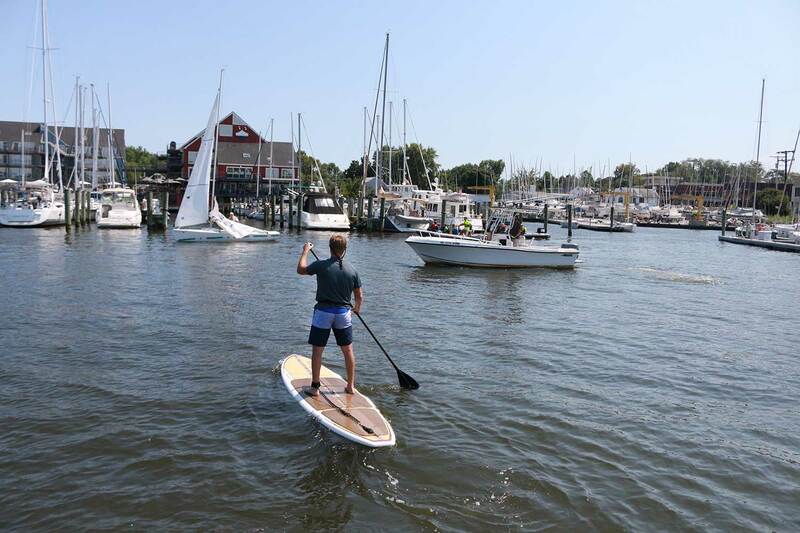 The Annapolis School of Seamanship is offering FREE boating education at the Norwalk Boat Show, where experts will share their expertise on a variety of boating topics. There are also several other free and fee-based opportunities right at the boat show where you can learn to improve your boat handling skills, troubleshoot and repair your boat, get your captain’s license, make docking less stressful, and more. One of the newest features is a Towed Watersports Workshop, where adults and junior boaters (aged 10 and up) can learn boat handling skills and best practices for tubing, skiing and other towed watersports to maximize both fun and safety. Information about all the opportunities to learn more about boating can be found at http://www.boatshownorwalk.com/. The 2015 Norwalk Boat Show is open from 10am to 6pm daily, this Thursday through Sunday, September 24–27, 2015. It’s right next to Calf Pasture Beach at Norwalk Cove Marina in East Norwalk, CT. For more information or to reserve your tickets online, visit www.BoatShowNorwalk.com. Using a stand up paddleboard in a congested harbor requires an increased focus on safety. When is a paddleboard a boat? According to the US Coast Guard an SUP is considered a “vessel,” so it’s important to understand certain boating responsibilities. Follow all local navigation rules and use common sense when paddling around other vessels that may not be as maneuverable or are restricted by their draft or size. Generally, a paddleboard is more easily able to turn and stop whereas larger craft take time and distance to stop. Typically, it is safest to pass astern of other vessels and let them cross in front of you. Try to avoid heavy boat traffic and pick a route away from congestion. Practice defensive paddling: Defensive paddling is preventing collisions and mishaps in spite of the actions of others around you. Remember boats may travel faster than you do and can carry a large wake. Some boats have awkward blind spots that prevent good visibility at certain trim angles so don’t assume a boater can always see you, especially at dawn or dusk. Wear bright colors and wear your life jacket with a whistle attached. Falling in, or swimming in heavily trafficked areas can lead to the start of a bad chain of events. In narrow channels stay as far right as possible and avoid crossing busy lanes. If you must, cross perpendicular to the lane so you get across quickly. If in a group, cross as a compact group – spreading out in a line like a bunch of baby ducks hinders traffic and increases the chance for a collision. Don’t leave home without it: A life jacket is the minimum gear – but it only works if you wear it so don’t leave it strapped to the board. If you’re concerned about comfort, take a look at high-tech, low-maintenance belt-pack inflatables or the newest vest designs that offer complete freedom of movement. Add a whistle – it will always beat yelling at the top of your lungs. Avoid paddling at night, but if you must, you’ll have to show a white light in sufficient time to avoid a collision. A flashlight or headlamp meets this requirement; a glow stick does not. And finally, a safety leash is most helpful in preventing an awkward and potentially dangerous separation from your board. Photo and SUP safety tips are courtesy of the BoatUS Foundation for Boating Safety and Clean Water at www.BoatUS.org.